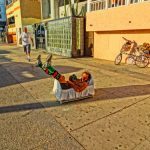 The unusual and freakish are the norm in Venice Beach, and I wouldn’t have it any other way. “Welcome to my crib,” was his mantra as people passed by. And it was well worth the price of admission. One Response to "Welcome to my crib"
Surprised you could pass up the opportunity to say come to Mama! LOL! After all, he’s quite a catch! LMAO! Marrie recently posted…The Needs of Men: As simple as 1,2,3, stroke?